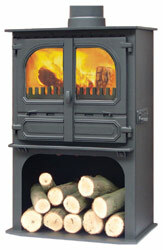 Dunsley Highlander 10 Multifuel Wood Burning Boiler Stove is a wide version of the popular Highlander 8 stove, with the same burning control system but nearly 100 mm wider than the 8 and with a fuel box area to take logs up to 550 mm long, this makes the highlander 10 more suitable for larger rooms. Each door has its own primary air controls, these control the amount of fuel being burnt and can also be closed down for overnight burning of fossil fuels. There is a choice of boiler, which is available in steel or stainless steel if required to connect into a direct hot water cylinder. This takes the place of a rear fire brick and can be installed at the factory or at a later date if required. 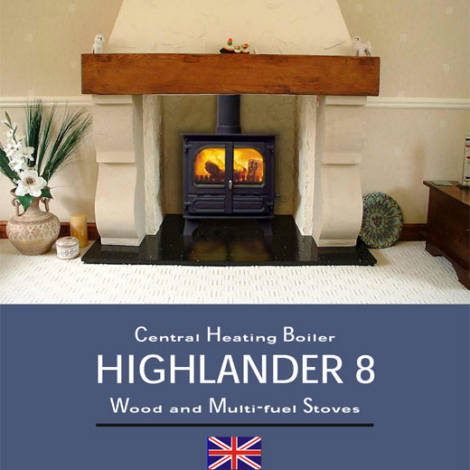 The Dunsley Highlander 10 Multifuel / Wood Burning Boiler Stove incorporates an integral boiler into the design of the popular Highlander 10 solid fuel stove. The output to the boiler is 42,800Btu, with up to 4kW of heat directly into the room, making this a good choice for smaller rooms. 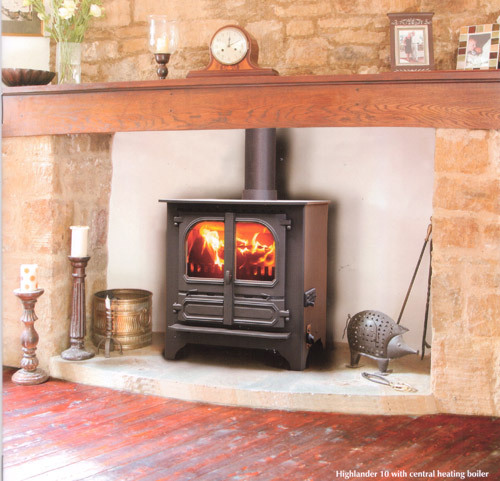 The Dunsley Highlander 10 boiler stove has a built in thermostat which automatically monitors the central heating temperature and controls the incoming air to meet the requirements of the central heating system. There is an option of an outside air kit to bring in combustion air from outside the building directly into the combustion chamber, avoiding the need to have an air vent in the room.